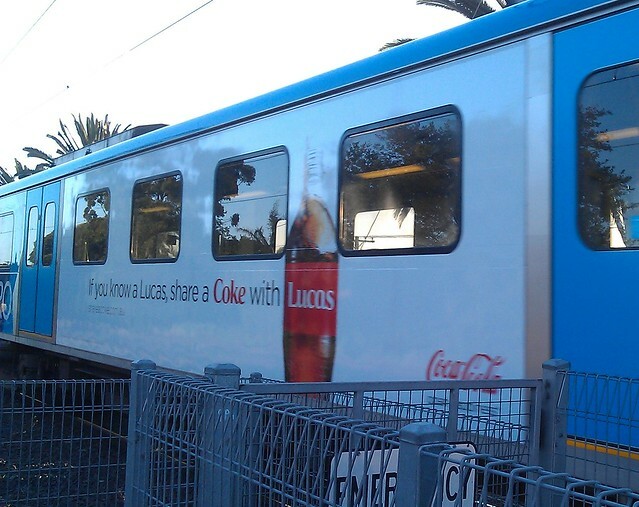 It was bound to happen once they started putting advertising on the sides of trains: Coke ads. Given trains are seen not just by passengers but also by motorists and pedestrians at level crossings, it could be quite lucrative for Metro. One can only hope the money goes into better services. My guess is we won’t see these on Comeng trains, due to the fluted sides. Too hard to stick ads onto. As with (apparently) the ones at stations in Sydney and elsewhere, it goes blank when a train approaches, so as not to be a distraction. Maybe all this advertising is paying for the shiny new flat-screens popping on the concourse and platforms at the underground stations. Where are the video displays in sydney, I haven’t seen any. In Japan the trains are flooded with advertising. Maybe heading the same way. Pretty much all over the world, public transport has adverts. I remember the old red rattlers had adverts in them. I wonder if they’ll find any money to put up some signs at Spencer St, telling passengers which platforms to go to for certain lines, in any place other than right out the front and facing away from the platforms. At least if they cover the trains in ads which are just big stickers, it’ll be much easier to remove any graffitti. I’m all for it. I hope they get on with the transition to those new screens quickly. Currently the platforms have both the old and new ones, showing different trains (line & eta) with no indication as to which is correct. Yesterday on platforms 1&2, the old ones were correct, but on 3&4 it was the new ones with the right information. And, of course, no announcements to help. I’d love ANY sort of visual display at Moonee Ponds. We still get to use the awesome, high-tech green button to find out our information! @Brian, I remember video screens / projectors being put up in Martin Place station facing the platform about 10 years ago, these usually show the news broadcasts from one of the commercial networks, and as Daniel says they blank out as a train approaches. At the Sydney tram museum at Loftus you can see a snap shot of the advertising within Sydney trams in the late sixties, I’ve seen adds for the change over to decimal currency and Bex powders. 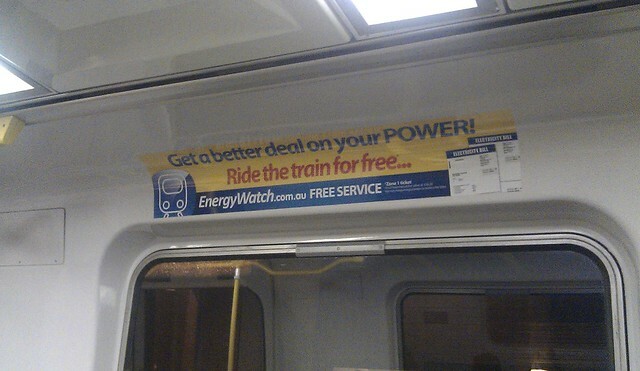 As long as they don’t cover the train windows with those ads – like with some trams! The mesh on the tram windows makes it harder to read street names, especially at night. Not good on an unfamiliar route! Those video screens in Sydney didn’t last long at all. I don’t know whether it was a technical failure or a commercial failure. It certainly seemed a bit impractical because it was conflicting with the station announcements. Meanwhile at Wynyard they have gone to plain black walls without even the traditional static billboards to lighten things up. I find the mesh ads placed over the tram windows annoying too. It is especially hard to see out when the window is opened and one has to try to look through two mesh stickers while seated. I agree with the post above that it is hard to see out at night and also when there is rainwater on the outside of the window. Same for Mordialloc – a ‘premium’ station and it doesn’t even have a clock, let alone a screen! The green button recorded information is almost inaudible most of the time, so if you want find out when the next train is coming, you have to interupt the woman behind the counter who spends the whole time talking to her friends in the waiting area. Japanese trains don’t carry external advertising but all have internal advertising. On most trains the advertising ‘blocks’ can be identified with code numbers, so each space on a carriage can be filled. Many commuter trains have video screens with news, quizzes, advertisements, along with ‘next stop’ info (usually English and Japanese). The Yamanote train line that runs around Tokyo has screens which show you where the stairs/escalators/elevators in relation to the carriage you’re on. Lovely stuff! @Philip, yes please, better signage at Southern Cross! 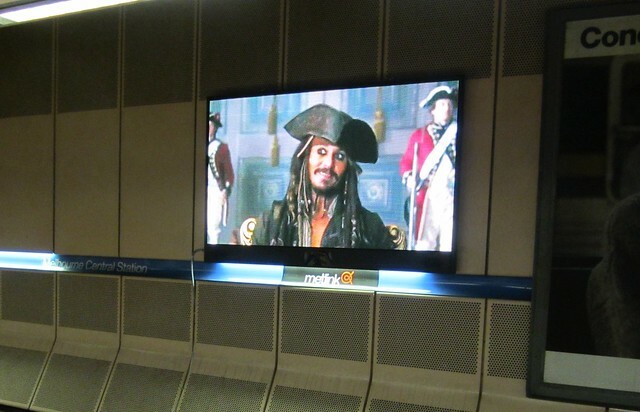 It would make sense to have the screens above the barriers, not miles away when you first enter the station. A lot can change on those screens in the time it takes to get up the escalators! And what is with the horrid placement of the Sugar Station store at the Collins St exit? Good for Sugar Station getting passerby customers, but an uneccessary obstacle for daily commuters! There are a fair amount of renovations going on at Southern Cross Station at the moment. I would have thought they could get it right the first time, but the stores are moving around again, even the ones like the bar that would have had a long term lease. Sugar Station will be up the top of the concourse. 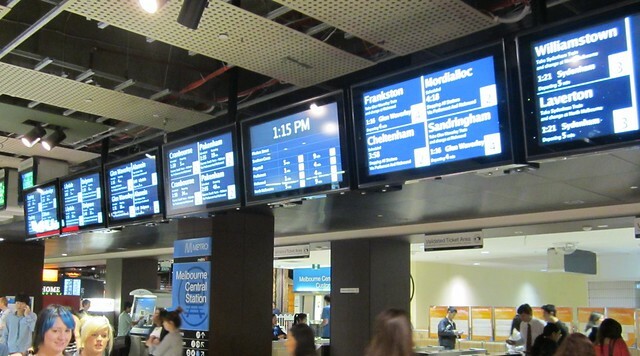 The new screens at the Elizabeth St end of Melb Central have terrible contrast. I’ll bet the screens are LCD colour (probably can’t buy anything else) but the images displayed are light grey on dark grey. What a waste, to me they are worse than the old ones.